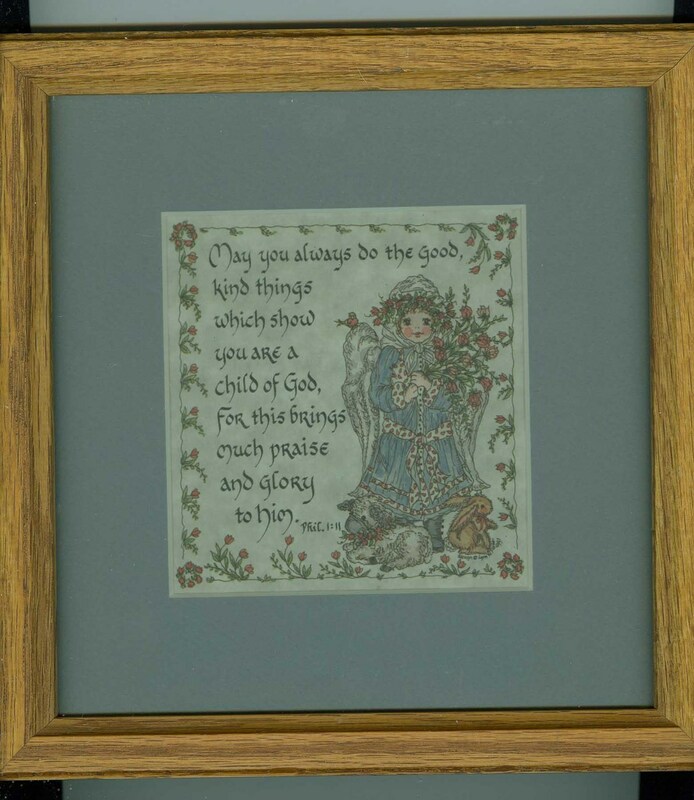 Child of God Angel Matted Framed Print This charming print reproduction shows a sweet child angel surrounded by flowers, a rabbit, sheep with a wee little bird perched on her wing. The text is from Phil.1:11, and reads: May you always do the good, kind things which show you are a child of God, for this brings much praise and glory to Him. The print itself measures 4 and 5/8 by 4 and 5/8 inches. Matted, the piece measures 9 and 1/8 by 9 and 1/8 inches. There are no marks or stains. It will come to you very carefully packaged with delivery confirmation. Because it is in a frame with glass, it will require lots of padding, which will increase the weight. Cost of shipping will depend on your zip code and will be actual cost with no handling fees. My home is smoke-free.